Are you an avid fan of mid-Century modern design, or are you just looking for a comfy place to sit and kick your feet up when you get home? In either case, our list of the best Mid Century Modern Sectional Sofas is sure to help you out! These featured designs are some of our most searched-for and best-selling furniture items, and our customers aren't the only ones who love them: we've tested them extensively and we think they're pretty great, too! Click here to skip down to the list! A sectional is an L-shaped couch or sofa. It is essentially a combination of a sofa (or loveseat) and a chaise lounge. 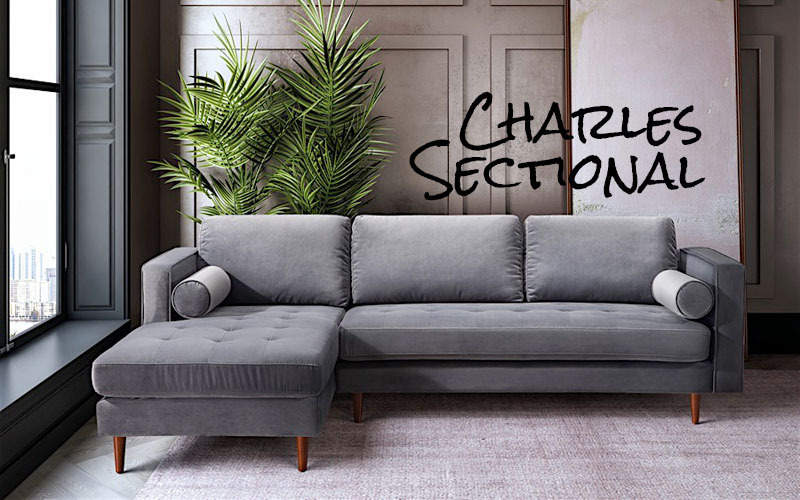 Sectionals can often be disassembled and reassembled in different configurations, such as moving the chaise from the left to the right side. While there are different styles of sectionals, most of ours are the type known as chaise sectionals - AKA traditional and bumper sectionals. Why Buy a Sectional Sofa? When you picture a sectional, you might think of a big, baggy behemoth of a sofa that takes up the whole living room while draining it of every ounce of style. 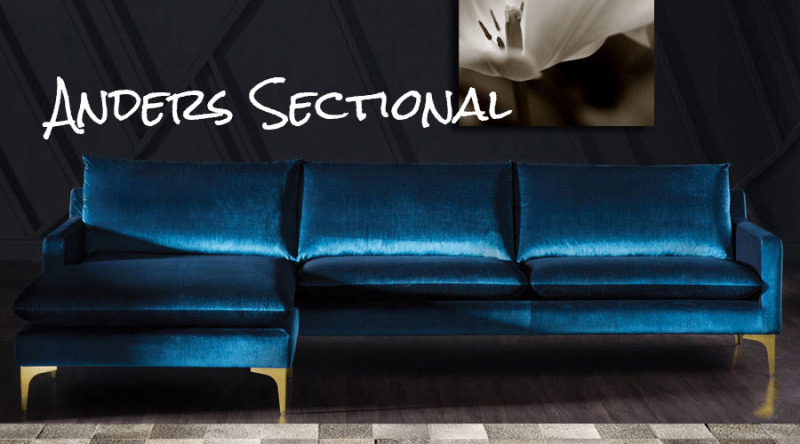 But we promise - none of these sectionals will do you that disservice! The best sectional for you is the one that suits your style! 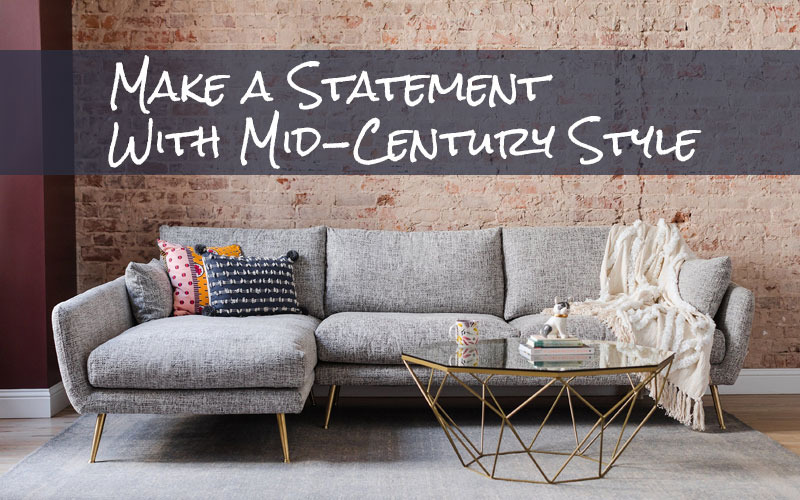 Check out our complete selection of modern sectionals to find the one that suits you and your home. Tufted sectionals often have more of a traditional feel to them, though they're quite modern when paired with the right silhouettes. They are often right at home in a luxurious setting, and include design elements reflective of mid Century modern style. In fact, many on this list are tufted! Reversible sectionals are great if you like to rearrange. Instead of buying a "left side chaise" or "right side chaise," you can switch your sectional around whenever the need arises. Leather furniture is modern, elegant, does not harbor dust, and is easy to wipe clean. It comes in sleek and beautiful finishes, but colors may be limited. Fabric upholstery can come in such a wide variety of colors and textures! High-quality fabrics are durable and scratch-resistant. You'll find that each of these MCM chaise sectional sofas have clean lines and simple yet elegant shapes inspired by the sofas of the 1940's-1970's. 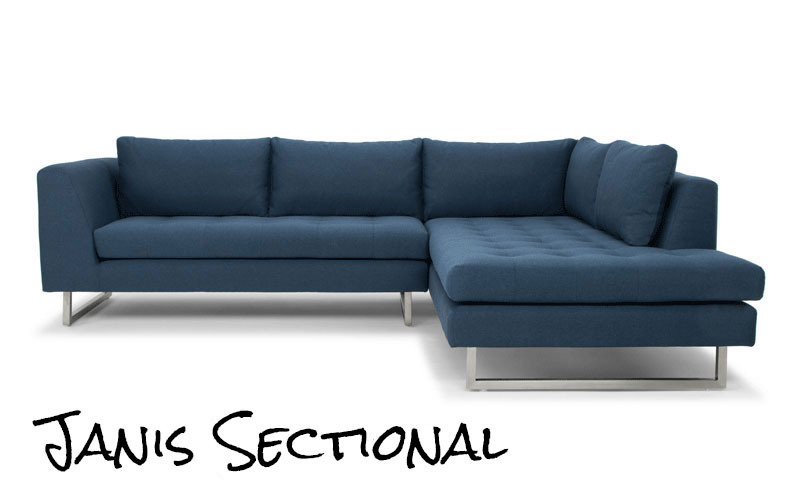 Without further ado, here are some of our favorite sectionals! The Charles Velvet Sectional's transitional style will be right at home in your house if you like to balance on the edge of traditional and modern. Plus, its comfort is second to none - always a prime consideration when you're purchasing a sofa! Its traditional-style wooden legs complement the rectangular, mid-modern silhouette of the sofa. Click here for exclusive savings on the Charles! This lovely fabric sectional has a grid-like pattern of button tufting on the seat. The fabric is available in your choice of a beautiful grey or navy blue velvet, designed for comfort and durability. The neutral color is the perfect backdrop for your collection of throw pillows, or go bold with the navy option! Charles also comes with bolster pillows on either side, and the low arms of the sofa make for a comfortable armrest. The Charles Velvet Sectional sofa is not reversible, but it is available in right or left-side chaise options so you can fit it to the configuration of your room. Looking for a velvet sectional sofa? The opulent Anders sofa is an absolute stunner, and it comes in two fabric options! One of our most popular sofas, this modern sectional is as stylish as can be - and highly customizable, too. 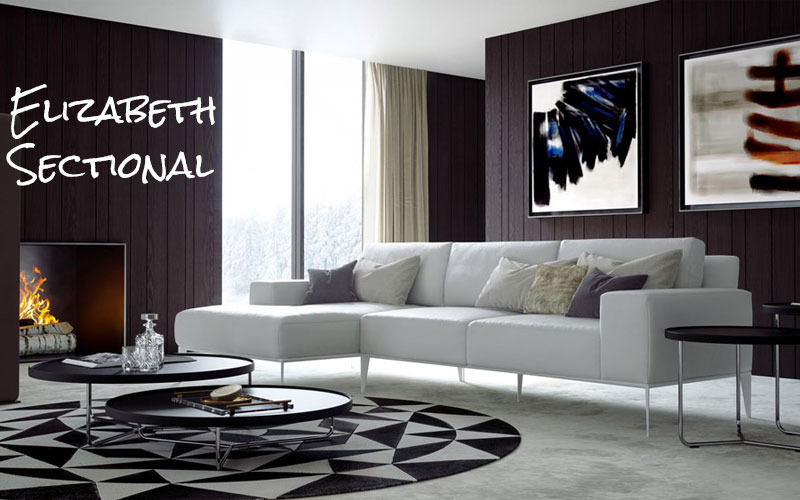 It has a sleek and modern yet comfortable design, and it'll make a statement in any room you put it in. It boasts slim seat cushions, three soft back cushions, and an architectural shape that's designed to make a statement. Click here for exclusive savings on the Anders Sectional! If you opt for the velvet upholstery, you'll be tempted to touch your Anders sofa every time you come into the room. It's just that soft! The fabric is absolutely as rich, lustrous, and gorgeous as can be, and it will elevate the style of your home the instant you bring it into the room! Choose from four beautiful, striking color options: Midnight Blue velvet or Navy Blue velvet made of a wool/nylon/polyester blend, Sand polyester/acrylic blend fabric, or Slate Grey polyester/acrylic blend fabric. And, the metal legs come in silver or gold! The Anders Sectional Sofa is reversible, so you can have the chaise on the right or the left and switch it around whenever you rearrange your room. A lovely gal, our Adelita Sectional will have you smitten in no time! Upon first glance, our Adelita Sectional might not be what you're thinking of when you picture a Mid Century Modern Sectional, which is one of our favorite things about her. Adelita offers an updated look to this classic style with its polyester-linen blend marbled gray upholstery and angled brushed gold legs. Comfy cushions filled with down sit atop the handcrafted kiln-dried wood frame and make the Adelita not just easy on the eyes, but a quality piece of furniture that you're sure to enjoy for years to come. 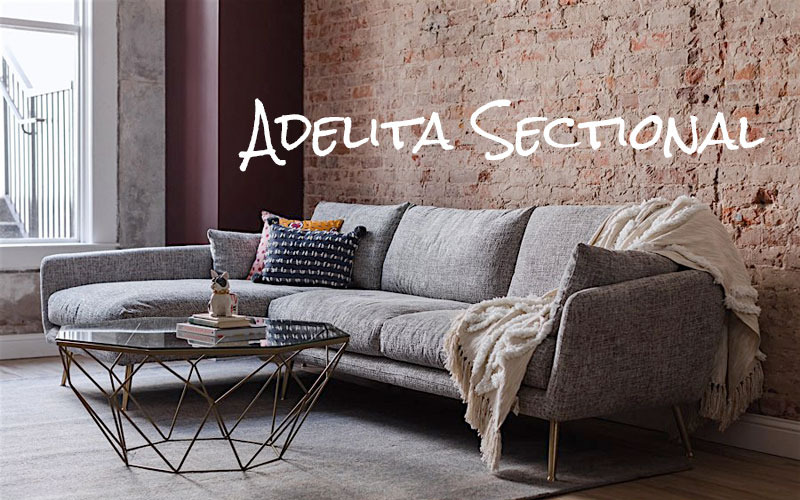 Click here for exclusive savings on the Adelita Sectional! You'll be able to choose from right or left facing so that your Adelita Sectional fits your space to a tee. Simply complete your room with a sophisticated coffee table, a stylish floor lamp, a few patterned pillows, and& a cozy throw to wrap up it all up. We're pretty certain that you've found your new favorite spot to kick up your feet and we couldn't be happier for you. We're not sure we've ever seen a sectional quite so luxe as the Colyn - though it has some close contenders on this list! Classic yet modern, with sumptuous upholstery and glamorous metal legs, the Colyn sectional is mid-century modern design at its finest. We can imagine it in an opulent den or as the centerpiece of a minimalist living room. The button-tufted cushions and rounded armrests are just dreamy! Click here for exclusive savings on the Colyn Sectional! Do you like to have choices? 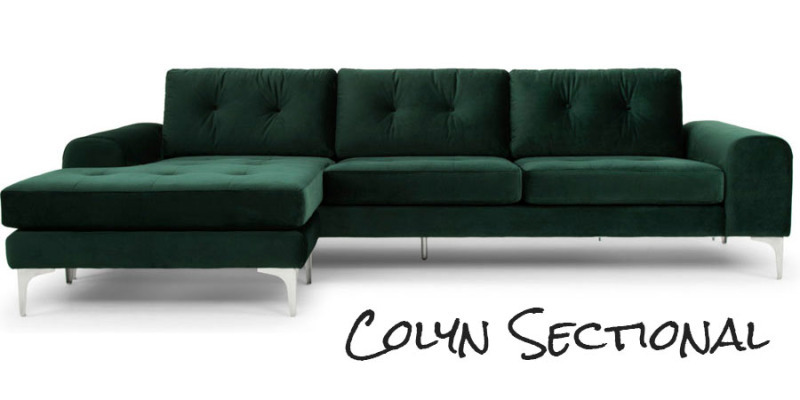 You can customize your Colyn sofa is so many ways. It comes in 5 amazing color options: Emerald Green, Sand, Shale Gray, Dark Gray Tweed, and Lagoon Blue. Plus, the best part: you can get the metal legs in either gold or stainless-steel! For all you gold lovers, you know it's hard to find gold furniture that makes a statement without being tacky. The Colyn will be the gorgeous, understated jewelry of your home, impressing all your guests and making you smile every time you walk into the room. This reversible sectional is easy to reconfigure, so you can have the chaise lounge on the left side or the right side of the sofa and switch back and forth whenever you want. This makes it even easier for the Colyn to fit any space! As one of our larger sectionals, the Opulent is a popular choice with families. Its deep cushions and big chaise are great for cuddling up with the kids, and the durable corduroy fabric will stand up to many years of use. Its hardwood frame, sturdy legs, and blocky arms will make it the anchor of your living room, family room, or den. Can't you just imagine curling up under a blanket with the snack of your choice? That's all we can think about when we look at this sofa! And trust us, it's as comfortable as it looks! Click here for exclusive savings on the Opulent Sectional! With the Opulent Sectional Sofa, you have 4 lovely color options to choose from: charcoal gray, dark brown, cappuccino (tan), or navy blue. It comes with six matching pillows so you can sink into a pile of comfort every time you need to kick back and relax. The Opulent is a reversible sectional, so you can have it facing either direction. All you have to do is move the ottoman over and flip the seat cushion over. One of our more spacious options, the Janis Sectional, is perfect for lounging the day away! With seating for up to 7 adults, Janis is the answer for small spaces that need to maximize seating and style. At the top of our list or pros is the button-tufted seat that gives the Janis a classy appearance, the sturdy brushed stainless steel legs and the plethora of colors and fabrics to choose from. When you take into account the choice of left or right facing and 5 different upholstery options, you're left with 10 distinct possibilities to choose from! Click here for exclusive savings on the Janis! If you're looking for a sectional for a larger space, Janis is also your gal. Place it in the middle of your living room to break it up a bit by dividing and defining your area. Add a few more key pieces like a console table, a few occasional chairs, a coffee table, and end table and you'll be set. This versatility is what makes our Janis Sectional a top contender. The Sydney's soft and comfortable fabric might be its best selling point. Or maybe it's the size and depth of the cushions, which are just calling out for you to take a nap on them! And perhaps it's the modern metal legs that make this comfortable sectional sofa right at home in any modern space. We can't decide - the Sydney sofa is just all-around great! 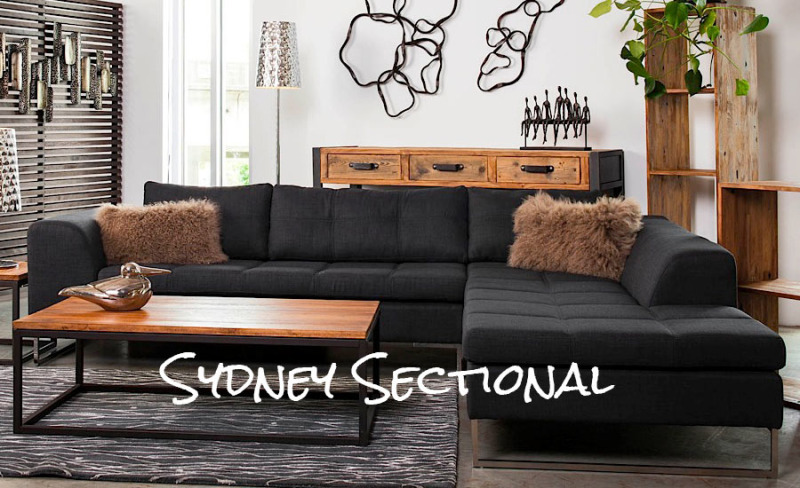 Click here for exclusive savings on our Sydney Sectional! It has a sturdy stainless steel base frame that can hold up to years of use and abuse, which is great if you have kids. The legs are also stainless steel. The large, deep chaise will be the coveted spot for all of your movie nights, while the soft tufted back cushions are comfy to lean back on. And, the gorgeous charcoal gray fabric is beautiful, soft, and durable. At 25-inches high, the Sydney has a low profile that won't overpower a space, so it's great for open concept floor plans where you want to have long sight lines. The Sydney comes in left chaise and right chaise configurations. The Matthew sectional sofa has a mid-century style that's trendy and classic at the same time! If you're looking for a neutral-colored, low-profile, subdued-looking sofa, the Matthew is perfect for you - but this modern sofa doesn't just fade into the background. It'll be the centerpiece of your living room, while still allowing the rest of your dècor to shine! 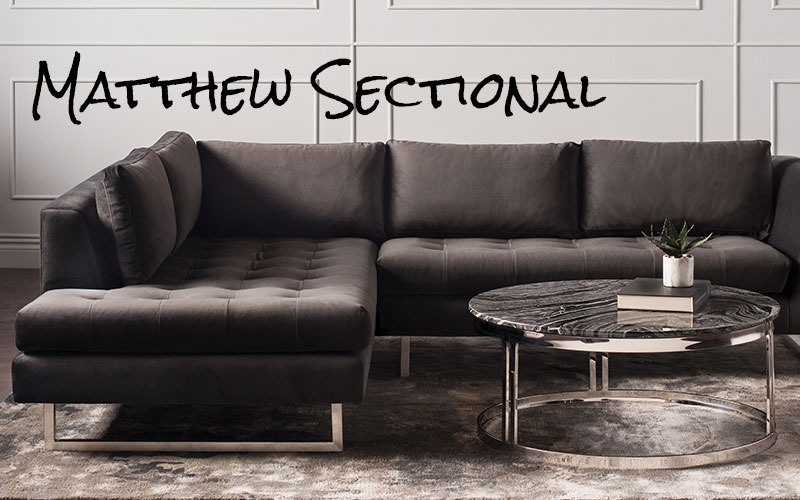 Click here for exclusive savings on the Matthew Sectional! The beautiful brushed steel legs give this sofa a modern edge, and the angles of the metal legs balance out the curves of the couch. You can choose from three upholstery options: Shale Grey, which is a medium tone that gives you a trendy modern look, Shadow Grey, which is a luxurious, moody deep black, and Sand, if you prefer a light and bright cream color. They're all beautiful, durable fabrics - it makes it hard to choose! The Matthew's ottoman design makes it all the easier to change the configuration of the sectional when you want to rearrange your furniture. This reversible sectional sofa makes it extra-easy for you to switch between a left orientation or right orientation, because all you have to do is slide the ottoman to the opposite side and flip the cushion over. Looking for luxuriously deep cushions and a sectional that will fill a large interior? The Elizabeth's oversized dimensions are just one of many reasons why it's perfect for your space. Its size, with an extra-wide chaise and extra-deep cushions, makes it incredibly comfortable to sit or lie down on, so it's not just beautiful - it's functional, like all good sofas should be. Its luxurious leather upholstery, modern shape, and metal accents make it an absolute beauty! Click here for exclusive savings on the Elizabeth Sectional! The Elizabeth comes in left or right chaise configurations to fit your space. That wraps up our Top 10 Best Mid-Century Modern Chaise Sectional Sofas! As you can see, there's a mid-century modern sectional for just about any home and dècor style. Though they all have the hallmarks of mid-century modern furniture, you can choose from such a wide variety of shapes and materials to find the sofa that's perfect for you and your home. Need a little help choosing? Some people have a picture in their head of exactly what they want, but most of us struggle to figure out exactly what furniture pieces are right for our homes. Here is a quick checklist of things to do to ensure you pick the right sectional sofa. Measure the Space - First, you need to make sure you find a sofa that fits your space. Measure the area where you're going to put the sofa. Each sofa has the width, length, and height dimensions listed (just click the links to find the product listings). We recommend using painter's tape and taping out the dimensions on your floor, so you can make sure the sofa fits your room without looking too big or small. 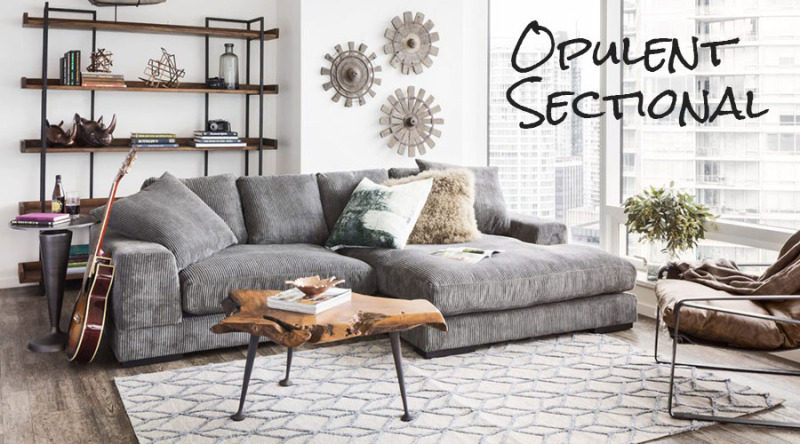 Determine the Configuration - Sectionals are a little trickier than other sofas because you have to figure out if you need a left or right orientation. So, figure out which way your sofa will face, and make sure to get the right orientation or choose a reversible sectional. Choose a Color - We usually recommend neutrals (like white, black, gray, tan) unless you absolutely fall in love with a brighter color and are sure you'll love it for a long time. If you love color and you decide to go for a neutral sofa, you can always add color to the room using throw pillows and blankets, rugs, or paint. If you love light colors, go ahead and pull the trigger. Today's modern upholstery is easy to clean! But if you love a moody look, there are plenty of dark greys, navy blues, and blacks that will look amazing in your space. Didn't find a sectional on this Top 10 list that suits your home and your style? Rest assured, we have plenty more to choose from! This is just a small sample of our selection of stunning modern sectionals and sofas! We know you'll love your new Modern Digs sofa, so go forth and shop!